The Bora Saw Plate is specially designed with an adjustable track on the underside that helps fit on top of almost any straight edge up to 3" wide. Designed to work best with the Bora WTX Clamp Edge, the Saw Plate allows your circular saw to glide smoothly, and in a perfectly straight line along the WTX Clamp Edge. Your saw can't wander or twist during cutting, so there's no binding or stalling when a blade goes slightly off line. The Saw Plate works with both left and right handed circular saws. Simply adjust the saw's blade for the depth you want to cut. Then slip the saw's base plate under the two Plate Clamps and tighten. Slip the Saw Plate on top of WTX Clamp Edge and you're ready to make perfect cuts every time. 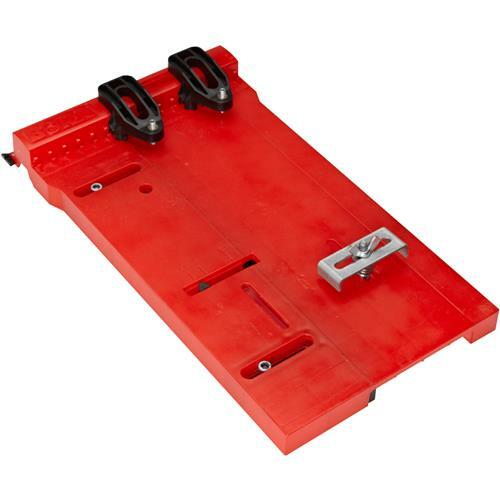 By using the optional Extension pieces with your WTX Clamp Edge, the Saw Plate can make cuts up to 8' in length.